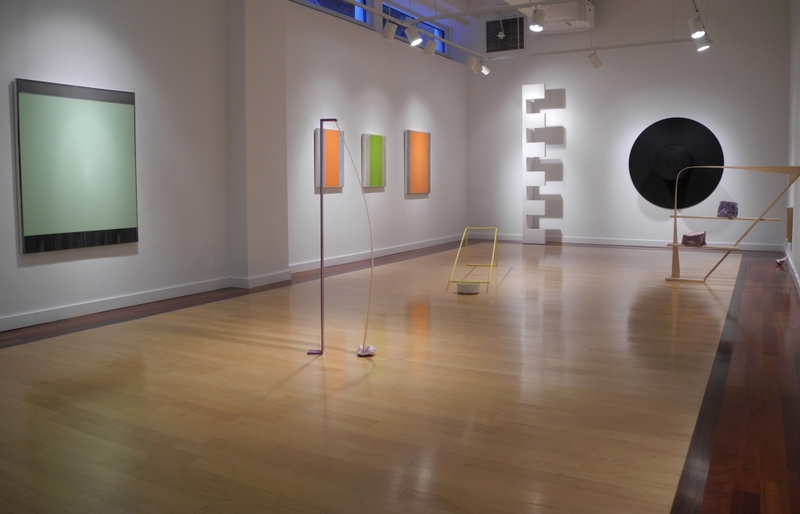 The work in “Linear Function,” a three-artist show at Carroll Square Gallery, is stronger on line than functionality. Alex Mayer’s paired contributions are a “white stack” that looks a bit like furniture and a “black hat” that looks exactly like a black hat, except that it’s made of painted plywood and is 60 inches in diameter. If these unadorned objects aren’t exactly Platonic ideals, they do possess an austerity that’s more philosophical than practical. The Washington conceptual sculptor is the only one of the trio to forgo color, so his work is the most minimalist in a room where nothing approaches the ornate. Nick Primo builds pillars and shelf-like constructions of ash and steel, which contrast slabs of glazed stoneware that are as lumpy as the wood and metal are sleek. The Baltimore artist also creates acrylic-and-graphite works he calls “architectural drawings,” some of which do hint at the volume and contours of possibly buildable structures. Primo’s simpler drawings, however, emphasize such elementary shapes as trapezoids and pennant-shaped triangles, and they rely primarily on their vividly mottled aqua, green and red. That makes them a neat fit with Douglas Witmer’s vibrant abstractions, which surround a bar or block of bright color with areas of streaky gray gesso, ranging from off-white to near-black. Each canvas features a candy flavor — lemon, orange or lime — whose radiance animates the subdued gesso frame like sunlight through a doorway. Elsewhere, the Philadelphia artist executes stripe paintings that employ other hues or even two bands of color in a single composition. Grouped together here, though, these five pictures attain a sort of perfection — if not of line or function, then simply of Witmer’s method.